We can add a name up to 10 characters to the flower egg. Please enter name or initials exactly as you would like them to appear. It's hunting season, egg hunting that is. These egg doodle dolls are a new twist on coloring eggs. Doodle dolls are washable pillow dolls that allow your child to use their imagination for endless hours of open ended play. When used with washable markers these dolls can be washed for another round of crafting and play. Alternatively using permanent marker will preserve your child's artwork for yeas to come. 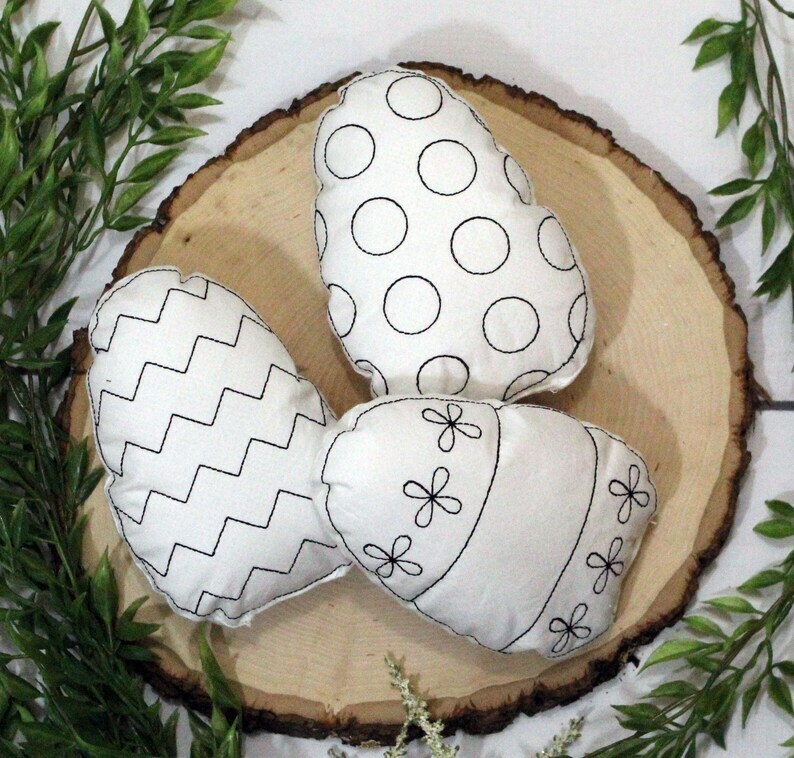 This egg doodle it doll is part of our Easter and Spring color your own doll pillow line. Build your own collection of eggs or check out or baby animals. Doodle Dolls appeal to a wide age range. Younger children love to color the dolls for the sear fun of coloring something other than paper. Older children love that the dolls can be washed and colored again to change the theme of their play. Rainy day activities have never been better. Each Egg pillow doll is approximately 6" tall by 4" wide. This listing is for a set of 3 doodle eggs. They come packaged in a gift box. The flower egg can be personalized with a name if you would like. Fabrics are pre-washed, machine wash cold gentle cycle. Please visit www.livilouandco.etsy.com for these and other great handmade items. Wholesale/bulk orders are welcome, please send a conversation for details. Orders are shipped via USPS 1st class mail. Like us on Facebook to keep up with new listings and get the scoop on sales. www.facebook.com/livilouandco.